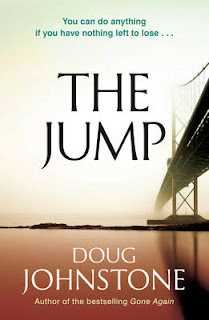 Today, the Blog Tour for Doug Johnstone's The Jump arrives at Euro Crime where we have a review of The Jump, written by Amanda Gillies. THE JUMP is the seventh book written by the very talented Doug Johnstone. Just when you start to wonder how on earth it could be possible for him to write anything better than his last masterpiece, he does it again and ups the stakes still further. Magnificent. This book is full of the usual Johnstone chaos but beautifully mixed in with a sad tale of life after bereavement – specifically, the tragic loss of a teenage son to suicide and how his parents struggle to cope in the aftermath. If you have yet to read anything by this author then I suggest you do so, without delay. His words always have a particularly hard-hitting edge to them, that lingers when the book is done and safely on your bookshelf. THE JUMP is the saddest of all Johnstone’s books and has left me with a lump in my throat, along with, of course, the usual exhilaration from being carried along on the tidal wave of emotions that work by this author never fails to evoke. I am lost for superlatives to describe this book. It’s excellent. Go and read it. Now.